Friends, I'm honored to share this conversation with Allison Titus in loving memory of her pug Elly who died shortly after we started this interview. Allison's devotion to her dogs and animals is palpable both in her life and in her poetry. I don't say this lightly: she is a force of love and goodness. A little about Allison: she is the author of three chapbooks: Instructions from the Narwhal, Topography of Tears, and the forthcoming Sob Story; two books of poems: Sum of every lost ship, The True Book of Animal Homes; and a novel, The Arsonist’s Song Has Nothing to Do with Fire. She is the recipient of an NEA literature fellowship, and her poems have appeared in A Public Space, Tin House, Boston Review, Blackbird, and Typo, among other journals. A proofreader / copy editor by day, she also teaches in the low-residency MFA program at New England College. Along with the poet Ashley Capps, she is editing an anthology called The New Sent(i)ence which explores the creative agency of non-human animals in 21st-century poetry. Before we talk about your pugs Eleanor (Elly) and Daisy, can you tell us a little about your background with fostering and rescuing pugs? What made you start, and how has it affected you? Ruben, the pug who inspired Allison to start rescuing. 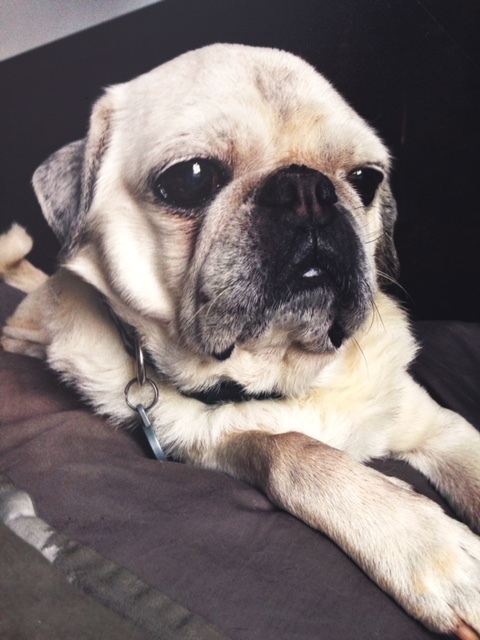 I started fostering pugs because I adopted Ruben, a pug who came from a goat farm. Pugs are weird! They are ancient foot warmers, and all they want is to lounge. This is the dog that is after my own heart: we are lazy, and we like to sprawl. When I discovered that there was a Mid-Atlantic Pug Rescue, I volunteered because I figured, if all it took for a dog to get a new permanent home was a temporary stay with me, or something as simple as a transport need, at the very least I could provide those things. The endless population of stray and homeless dogs—I mean all homeless animals, but dogs have wedged themselves the deepest in my life—is one systemic problem (of many!) that breaks my heart on a daily (hourly) basis. I also believe very strongly in adopting animals rather than buying them, while understanding that a person might want a particular breed of dog for a variety of legitimate reasons, and that’s where rescue groups dedicated to certain breeds come in: they remove a fraction of animals from already over-populated shelters and offer an alternative to purchasing a purebred dog from a breeder or pet store. You mentioned Elly and Daisy helped you through some difficult times, something I can really relate to. I feel like I’m always trying to explain why dog companionship is such soul salve, and I’m curious about your take. It’s so hard to explain to someone who doesn’t already get it, isn’t it? And if you get it, you get it, absolutely. There was a period of time, of about three years, when I moved from apartment to apartment by myself with Elly and Daisy. At that point, I’d never lived alone, and I had one understanding of what home was—the house I had lived in for 14 years when I was married. And so all of a sudden, the only thing that made me understand what home was became: wherever Elly and Daisy were. Even if it was a temporary place, as long as those guys were with me, we were OK/we were home. I guess that was the first time in my life that I really understood “home” as a concept that could be embodied emotionally rather than as something that was primarily represented as a physical place. And they were just such great companions during a time in my life when I was the saddest and the loneliest: I don’t know what I would have done without them; they made the hours bearable and hilarious. Also they taught me what resilience is. "They taught me what resilience is." As you may have gathered from my fangirling on social media, your latest book The True Book of Animal Homes (Saturnalia, 2017) absolutely floored me. (I read the entire collection out loud to my husband because I needed to talk about it with someone immediately.) It has such a concrete and expansive vision of its world. For those who haven’t read it yet, it’s divided into three sections: the office poems, the animal homes poem, and the essay poems. I love how the collection uses habitat as a way to emphasize how close the human and animal worlds are, all the overlap. How did the arc of this book take shape for you? Oh my gosh: thank you! That is actually the most amazing compliment I think I’ve ever been given: that you would have read my poems aloud. I am so lucky my book found you and your heart. The book took shape over several long years, and the office poems were written first. I spent a lot of my post-grad years working temp jobs that were pretty corporate, and I was extremely out of my element in those environments. I am basically always disheveled. I spent eight hours a day feeling like an alien, and at some point, I had to make those days into something that felt worthwhile, that wasn’t just lost beige time, or I would have died. OK, that’s dramatic, but I would have gone crazy. So I started writing poems about real and invented offices. I thought a lot about the spaces and stations I occupied in those roles, physically and philosophically. And then as the years went on, I started writing more overtly about animals, and it was just such a natural overlap, to combine those two impulses, considering the space and stations humans and non-human animals are relegated to. We’re all just roaming around the same planet, trying to stay alive, hoping to match our desires with whatever kindred external force is compatible and game. And then the final gesture, the essay poems—naming them “essays” allowed them to exist for me in a space that felt more...sanctioned to hold a stance but not subvert or sacrifice the craft of the poem. I wanted those poems to do what essays aim to do: try to establish an argument by exploring an idea or a series of ideas that accumulate to some larger question or inquiry. "We’re all just roaming around the same planet, trying to stay alive, hoping to match our desires with whatever kindred external force is compatible and game." I see the offices in the first section as a symbol of both the human disconnect from and intersection with animal world. How our fates are yoked to the fate of animals. Has caring for your dogs contributed to this outlook in your poems? I think living with dogs for my whole life, and being the kind of person who considers my dogs to absolutely be family, and being aware that not everyone feels that way, and that not everyone has had a bonded relationship with an animal, and that actually so many animals suffer such terrible abuse and neglect at the hand of humans…I think my awareness of that disparity and disconnect, and my awareness of the extreme variability in our human experience with non-human animals informs the poems, and the book in general. the worker says, It happens all the time. How did your veganism help inform this collection? And what were the specific challenges of writing about a subject both so personal and (usually) divisive? I became vegan in 2009, and I think as I became more informed about veganism and about animal rights initiatives, the lifestyle became more political for me than I expected it to. And it just grew harder to avoid having that fundamental layer of my life not become a texture in my poems—basically, veganism is my one conviction; I have no religion, have never had a religion. I believe in kindness and in generosity and in doing no harm. I want to try to get close to what I feel are the essential things, in my poems, but I don’t want to just write polemics that sacrifice artfulness for pronouncement. I care too much about poems to not worry that there’s a tricky balance to strike between idea and image and experience. More than I care about creating anything defined, I want to create something felt. "More than I care about creating anything defined, I want to create something felt." I think this is a good reminder that despair can be neutral, that it doesn’t need to be cured, that maybe what we need is a better language for our inner worlds. Can you talk about what prompted this poem? Honestly, it was written so many years ago, I don’t remember what the exact impetus was, beyond creating a specific texture and intensity: but yes, it seems at some point, maybe the desire is not to repress the darkness, but to embrace it. Life is hard and sad and strange, and also miraculous: why pretend it’s anything else? Which is more necessary to you right now: poems about grief or poems about joy? For now: poems about grief. A metaphor or simile for Elly and Daisy? Well, Elly is (was—she passed away in July) my shadow. Daisy … is the Fear of Missing Out, embodied. Also, Daisy came with her name. She would be the perfect Betty.